Enchanted forests, haunted hillsides, secluded cabins and the creatures that reside in dark places - have had us biting our nails since the early German Expressionist film era. Witches, werewolves, monsters and maniacs can be lurking 'round the corner just about any place you can imagine. To celebrate the release of the Season of the Witch out on DVD and Blu-ray June 28th we're going to take a look at some of the most iconic and eerie locales in thrillers and horror films that make for the best places to splatter, slice and slash. Crystal Lake is well-known from the beloved Friday The 13th and even though those films are set in New York, there so happens to be a real Crystal Lake in the San Gabriel's near Los Angeles that many horror fans like to claim as their own. Lake Placid is home to a killer crocodile and movies like Eden Lake, Zombie Lake, Rogue, What Lies Beneath, Lake Dead and of course Sleepaway Camp will make you want to go out and purchase a life vest and/or take some self-defense classes. Deliverance and The Host are set on rivers and Ghost Ship is on the ocean, but we won't hold it against them. Cabin Fever, The Shining, Hostel, and Vacancy are just a few of the great films set in secluded vacation spots. Of more recent fame, Lars Von Teir's Antichrist took the cabin in "Eden" to a whole new level of crazy. No one can of course touch the masterpiece Evil Dead, where incantations read in the basement of the cabin wake up some flesh eating demons that no one forgets. The Blair Witch Project, Wrong Turn, Sleepy Hallow, Dreamcatcher, Shrooms all take us on a journey along streams, mossy banks and haunting willows that creep the living daylights out of you. Taking it to the jungles, The Ruins and The Island of Dr Moreau receive honorable mentions. Season of the Witch , out on DVD and Blue-ray June 28th crosses over into the supernatural into perilous terrain that makes way for a terrifying and powerful force that determines the fate of the world. Scream, Paranormal Activity, The Amityville Horror, The Grudge, The Others, The Haunting in Connecticut are just a few of the films that really take it to the next level and bring the horror and gore way past your comfort zone. Funny Games could easily fit into the Cabin category but it still hits way too close to home. And grandpa's house most certainly counts for The Texas Chainsaw Massacre. Hills get a runner up location nod due to films like The Hills Have Eyes and the 1959 B Movie Classic, House on Haunted Hill. And sure Silent Hill even though we know it doesn't really count. Oscar© winner Nicolas Cage ('National Treasure', Best Actor, 'Leaving Las Vegas') and Ron Perlman ('Hellboy', TV's 'Sons of Anarchy') star in SEASON OF THE WITCH, a supernatural action adventure about a heroic Crusader, Knight Behmen (Cage) and his fellow soldier, Felson (Perlman) who must transport a woman accused of being a witch to a remote monastery. The arduous journey across perilous terrain tests their strength and courage as they discover the girl's secret and find themselves battling a terrifyingly powerful force that will determine the fate of the world. 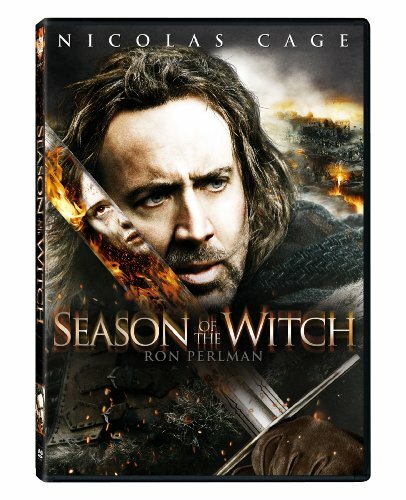 Season of the Witch Blu-ray (Catalog # 2275600) U.S. Season of the Witch DVD (Catalog # 2275593) U.S.